Francis was a young nobleman at the court of the King of Spain. He became a Duke when he was only thirty-three and lived a happy, peaceful life with his wife Eleanor and their eight children. But unlike so many other powerful nobles, Francis was a perfect Christian gentleman, a true man of God and his great joy was to receive Holy Communion often. This happy life ended when his beloved wife died. Francis did something that astonished all the nobles of Spain; he gave up his Dukedom to his son Charles and became a Jesuit priest. So many people came to his first Mass that they had to set up an altar outdoors, but his Superior tested him by treating him in exactly the opposite way he had been used to all his forty-one years of life. He who had once been a Duke had to help the cook, carrying wood for the fire and sweeping the kitchen. When he served food to the priests and brothers, he had to kneel down in front of them all and beg them to forgive him for being so clumsy! Still he never once complained or grumbled. The only time he became angry was when anyone treated him with respect as if he was still a Duke. Once a doctor who had to take care of a painful wound Francis had gotten said to him: "I am afraid, my lord, that I have to hurt your grace." The saint answered that he would not hurt him more than he was right then by calling him "my lord" and "your grace." It was not too long before the humble priest accomplished wonderful works for God's glory as he preached everywhere and advised many important people. He spread the Society of Jesus all over Spain and in Portugal. When he was made Superior General of the Jesuits, he sent missionaries all over the world. 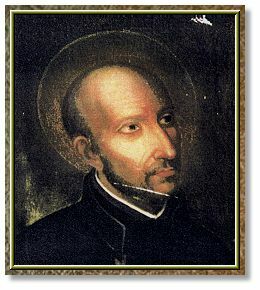 Under his guidance, the Jesuits grew to be a very great help to the Church in many lands. Through all such success, St. Francis Borgia remained completely humble. His feast day is October 10.